An apple may have caused problems in The Garden of Eden, but its nutritional properties can save many a heart. Pectin in apples can help to lower LDL cholesterol, is good for diabetes and management, good source of vitamin C, soluble and insoluble fiber, flavanoids and antioxidants. 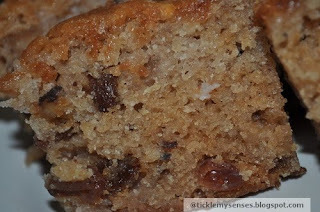 This is a very simple and tasty apple cake recipe . A foolproof and effortless way to get 5 portions of fruit and veg a day. You can use Granny Smith cooking apples or any other variety of apple. I have used Fuji pink apples for this recipe. 2. Put the sugar and vegetable oil in a mixing bowl, and beat until very well blended. Add the eggs one at a time, beating well after each addition. Add the vanilla. Sift together the flour, baking soda, cinnamon, nutmeg, and salt, and gradually add to the sugar and eggs, mixing just until well blended. 3. Stir in the apples, walnuts, and raisins and pour into a buttered and 9-by-13-inch baking pan. 4. Bake in the preheated oven until a skewer or toothpick inserted into the center of the cake comes out clean, takes 40 mins to about 1 hour (begin checking after40 minutes). Remove from the oven, and allow to cool in the pan. Apple cake is ready, serve warm at tea time or chilled for dessert. love them ....please post more recipes. i follow your blog but silently...so a silent admirer of your blog.